Still it may be a minuscule 0.20% of total Asian internet population, but for a country with high impeding forces for innovation adaptation; a 47% year on year growth in total internet penetration is a significant achievement. According to the latest statistics published by internetworldstats.com quoting ITU as the source, Sri Lanka stood at 24th rank in Asia’s internet penetration rates, with a 11.8% penetration into total population. This is the first time, the country’s internet penetration rate passed the 10% mark. 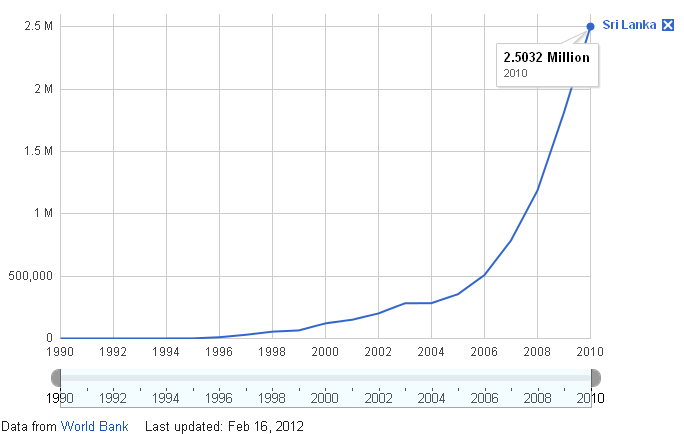 As of 31st December 2011, there were 2,503,194 total internet users in the island nation. This is a 47% YOY growth compared to previous year’s 1.7 million figure, which stood approximately around 8% of the population. However, a significant majority of around 85% of these internet users represent urban and suburban places, according to a sample survey we did recently for one of our clients. Country’s internet penetration rate increased during the year 2011, largely driven by the adaptation of mobile broadband powered by HSDPA and HSPA technologies. 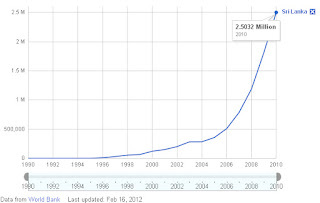 During the year 2011, competition among mobile telco’s seemingly focused on data. In fact, in a country where mobile voice penetration is almost 90%, and the internet penetration is just around 8% you couldn’t expect a wiser thing to do for a mobile telco company, rather than exploiting the market opportunities left over by the fixed line broadband providers. All in all, I see the 47% YOY growth rate as a loud alarm for some companies in Sri Lanka who delays adapting their brands to Digital Media revolution, citing ‘insignificant internet penetration’ as a reason.